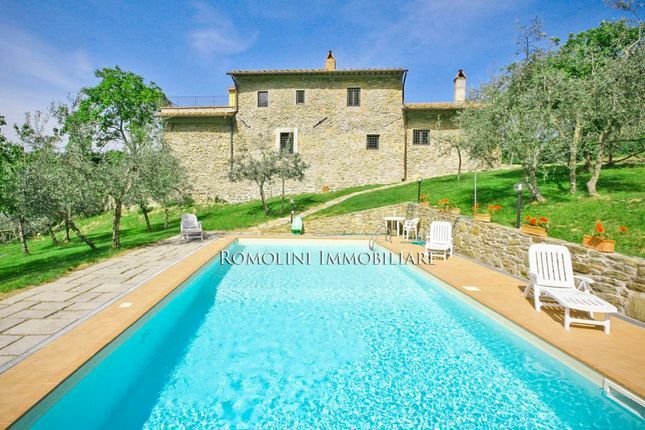 On the Chianti Hills, not far from the town of Greve, restored farmhouse with barn, pool and 12.3 hectares of land. Easily reached and in an extremely quiet location, the farmhouse is fitted with all the necessary services in the nearby town (4km; 5’) and allows easily moving through the most renowned towns of the Tuscan hinterland: Greve in Chianti (20km; 30’), the beautiful Firenze (25km; 35’), the turreted San Gimignano (62km; 1h 10’), Monteriggioni (63km; 1h), the Etruscan Volterra (82km; 1h 25’) and the medieval Siena (84km; 1h 20’). The most convenient airports to reach the property are Firenze Peretola (48km; 45’), Pisa Galilei (99km; 1h 30’), Bologna Marconi (129km; 1h 35’) and Perugia Sant’Egidio (146km; 1h 45’). - First floor: Four bedrooms, two bathrooms, loft and terrace. The barn (70 sqm – 753 sqft) is laid out onto two floors and could easily be converted into a guest house. The building is a typical stone and masonry building in Tuscan style. A careful restoration allowed valorizing the characteristics of the buildings while keeping unaltered its original look. On the inside one can find terracotta floors, wooden beams and hand worked stone fireplaces. The barn has been recently built abiding by the Tuscan style and complying with the most recent anti-seismic rules. The property is made up of 12.3 hectares of land, partially covered in garden nearby the farmhouse. An olive grove (5.6 ha) allows producing excellent extra-virgin olive oil. The remaining surface is split among a chestnut grove (2.5 ha) and a wood (3.2 ha). The 10 x 5 m swimming pool is located right next to the farmhouse and is equipped with a convenient stone-paved solarium. The farmhouse, given its excellent location in the Tuscan countryside, very quiet and easily reached, is perfect for anyone looking for a building to use in the hosting business, perhaps as a B&B. The barn can be converted into a guest house to expand the capacity of the structure. Alternatively, it is always possible to use the farmhouse as a private residence.